This Bookreporter.com Special Newsletter spotlights a book that we know people will be talking about this spring. 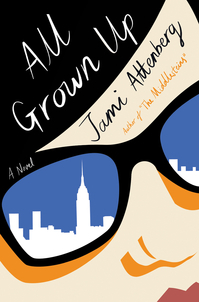 Read more about it, and enter our Spring Preview Contest by Thursday, March 30th at 11:59am ET for a chance to win one of five copies of ALL GROWN UP by Jami Attenberg, which is now available. Please note that each contest is only open for 24 hours, so you will need to act quickly! From the New York Times bestselling author of THE MIDDLESTEINS comes a wickedly funny novel about a 39-year-old single, childfree woman who defies convention as she seeks connection. Who is Andrea Bern? When her therapist asks the question, Andrea knows the right things to say: she’s a designer, a friend, a daughter, a sister. But it’s what she leaves unsaid --- she’s alone, a drinker, a former artist, a shrieker in bed, captain of the sinking ship that is her flesh --- that feels the most true. Everyone around her seems to have an entirely different idea of what it means to be an adult: her best friend, Indigo, is getting married; her brother --- who miraculously seems unscathed by their shared tumultuous childhood --- and sister-in-law are having a hoped-for baby; and her friend Matthew continues to wholly devote himself to making dark paintings at the cost of being flat broke. - Visit Jami Attenberg's website, Instagram and Tumblr. - Connect with Jami Attenberg on Facebook and Twitter.